Since the 2.4 GHz band is so crowed, the channels utilized by your APs are crucial. It’s easy to have co-channel interference from neighboring networks and even your own APs. For this lower band, try to stick with the non-overlapping channels of 1, 6 and 11 at 20 MHz channel-widths. Although most APs and wireless controllers have an automatic channel feature, sometimes they don’t work well. Double-check the automatic channel assignments to see if they make sense. If they don’t make sense, try setting the channels yourself. When verifying automatic channel assignment or manually setting them, it’s a good idea to get out the floor plan maps that have the AP locations identified. That way you can visualize the AP locations and write down the channel assignments. If you have more than three APs, you’ll have to reuse the channels 1, 6 and 11. But try to make it so APs set to the same channel are as far away from each other as possible. For instance, if you have six APs spread out equally going down a long hallway, you set the AP channels in order: 1, 6, 11, 1, 6, 11. Don’t forget about any other levels of the buildings Try to minimize setting APs with the same channels on top of each other, too. APs have control over what data rates are supported for the connections to Wi-Fi clients. When APs are supporting the lowest data rates, that means they’ll accept slow/poor connections. Though APs that don’t support he lowest data rates will drop Wi-Fi clients quicker, that’s typically what you want. You don’t want Wi-Fi clients staying connected to APs when the connection gets too slow, because it will slow the overall performance of the network. If a Wi-Fi network is properly designed with good coverage, you want the Wi-Fi clients to roam to the best AP as quick as possible, not stick to an AP that provides a slower connection. Most enterprise-level APs provide control over the exact data rates that are enabled. If possible, consider disabling the lowest data rates: 1 – 12 Mbps. If you have a high-density network with great coverage, consider disabling further rates, maybe even up to 54 Mbps. 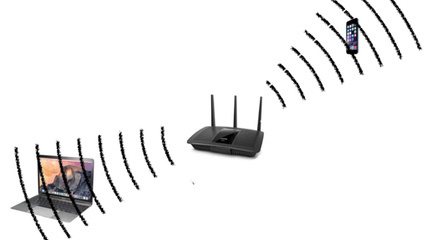 An overall poor wireless design and/or configuration can cause performance issues on the Wi-Fi. A professional wireless site survey should be performed to figure out proper AP locations and a post-install survey done to verify correct coverage. Resurveying should also be done after any significant physical changes to the building and/or layout. Without performing map-based site surveys with tools like Airmagnet or Ekahau, it’s hard to visualize coverage to discover any coverage holes. Survey tools also help identify co-channel interference and aid in setting proper channel assignments. And don’t design a network solely on coverage. Design for throughput and user density as well.